A Banbury man and a teenage boy from Steeple Aston were arrested as part of a police burglary operation in Cherwell and west Oxfordshire. Neighbourhood officers launched Operation Jockey on June 18, offering advice to residents on keeping homes and belongings secure during the summer as well as undertaking visible and covert tactics to disrupt those intent on stealing. A 23-year-old man from Banbury was arrested on suspicion of burglary. He was released under investigation and deported to Poland to serve an 18 month prison sentence due to an outstanding European arrest warrant. A 16-year-old boy from Steeple Aston was arrested on suspicion of burglary and has been released under investigation. While Stuart Glen, 24, of Windrush Valley Road, Witney was arrested and charged with one count of burglary. 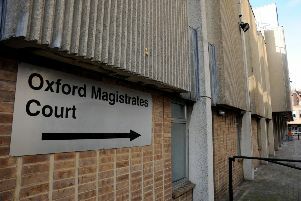 He has been remanded to appear at Oxford Crown Court on July 20. Anyone with questions or concerns surrounding burglary in your area, contact the local neighbourhood policing team at www.police.uk. For those in Cherwell and west Oxfordshire, the teams can be followed on Twitter at @TVP_WestOxon, @TVP_Bicester or @TVP_Banbury. For regular updates on crime and security advice, sign up to Thames Valley Alerts.